Creating a space to learn: how can we share experiences from the chalkface? Stephen Carrick-Davies, CEO of Mondo Foundation, asks what would radical education reformers of the past make of education initiatives being developed in some of the poorest regions of the world today. Joseph Lancaster was a public education innovator who knew a thing or two about running a school on a budget. Born in 1778 at a time when education in this country was limited to the privileged few, he set up his first school on the floor of his father’s shop. Within 50 years he had pioneered a pedagogy which was implemented across 1,500 ‘Lancastrian’ schools and included new concepts such as peer-learning and the recruitment of monitors to support classroom teaching. Whether this was a creative move to avoid the cost of employing more teachers we may never know. What we do know is that 240 years later, in a time of austerity and societal change, our schools need similar innovators to formulate new models of teaching and learning. But where is this innovation likely to come from? Is it the well-resourced schools of the west, or is change more likely to come from some of the poorest parts of the world, where the floor is still the classroom? I had never heard about Joseph Lancaster until I attended a remarkable workshop last week run by the British Foreign School Society, a charity which was established by Royal Charter in 1906 to carry on the work of Lancaster. Today the Society awards grants of just over £700,000 a year for education projects in the UK and around the world. So what? I hear you ask. Many charities were set up years ago to advance the causes of education and social justice. Yes, but today BFSS does so much more. Each year they bring the 60 or so beneficiaries together, to create a space to share, learn and collaborate. In speaking to previous participants, it was clear that the facilitated discussion groups were effective in helping us to look at strategic issues and share from our experience in the field. Topics included developing quality early childhood education, breaking barriers for disabled students to access services, educating street children, constructing new schools and even how to formulate your Theory of Change (whilst at the same time securing funding for your practice of change!). Many of the charities BFSS funds, like Mondo Foundation which I have the privilege of leading, are working to establish transformative educational practices. Like Lancaster, we fund educators to teach children in the equivalent of the ‘shop floor’; Temporary Learning Centres with a carpet on the floor if you are lucky. However, rather than being the poor distant relative of the UK education family, the BFSS supported programmes are, like Lancaster’s, finding ways to innovate and develop ideas from which the UK education system could learn. Necessity may be the “mother of invention” but this ‘mother’ is getting restless and needs a passport! Many funding bodies take the time to help beneficiaries apply for funding, but in my experience of 30 years of working for and leading non-profit organisations, it is rare to find funders both transparent enough to share the impact of their work, and humble enough to ask beneficiaries for help. I’m discovering more and more, that when asked to share learning from their mistakes and challenges, charity leaders of small organisations are eager to co-operate. Maybe because knowledge is linked to power, and if you don’t have a lot of power you are more willing to share what you have. Indeed, I would argue that the pre-eminent leadership skill for the 21st Century charity leader is being able to share. In the past we were defined by what we owned, today we are best defined by what we share. Just look at how social media has become the most important ‘window’ for small charities. But we also need safe confessional spaces where we can gather, cooperate and be recharged to respond again to the phenomenal challenges we face in our educational learning ‘worlds’. For example, how do you start to support a wonderful teacher committed enough to walk 6 miles each day to school to teach 60 pupils in a TLC before walking 6 miles home only to be paid enough to eat rice and dahl for the 7th night in a row? How do you help schools continue to educate their pupils through ‘pop-up’ Saturday schools when local political unrest has closed schools for months on end? 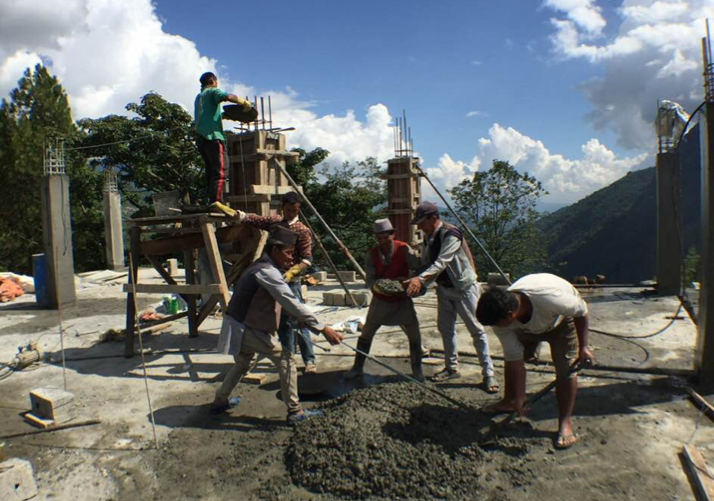 How do you distil and funnel the precious spirit of resilience shown each day by villagers whose homes and lives have been shattered by earthquakes, towards re-training them to build new earthquake resilient village schools? Is this process not education itself? And with a ‘nudge’ to Lancaster and later reformers, how do schools throw off the shackles of a Victorian rote-learning mindset and be given the autonomy and support to innovate and develop teaching methods which better prepare students for employability, enterprise and life-time learning? Is this teaching style taught or caught? And if so, where are the mentors who have the skills to model this change over many years? It’s not so much “sage on the stage”, or even “guide by the side”, we need “professionals in the pit of learning,” inspiring students on to become future educators whilst they are still on the classroom floor. Small-scale, locally-led organisations are nimble, able to build deep reciprocal relationships and learn from their partners. We are best placed to prototype models of change and disseminate our findings. How refreshing then to know that BFSS keeps its focus on funding small organisations; that it believes that small is still beautiful and that collaboration and affiliation are at the heart of change and that what we learn is as powerful as what we change. Indeed, the two are inseparable. 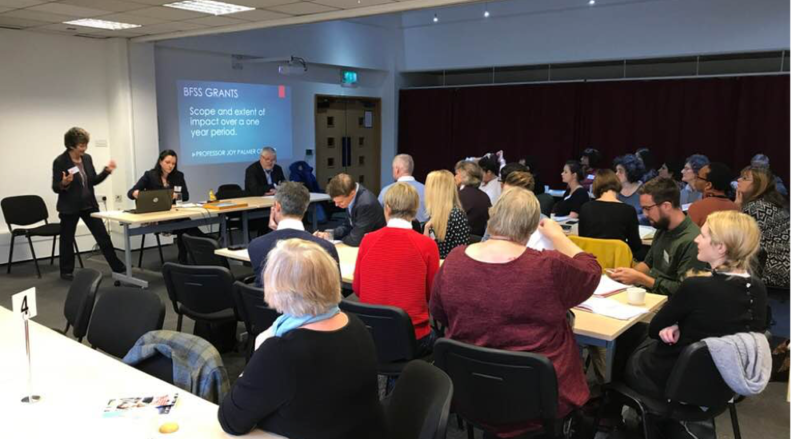 Following research and feedback from its projects the BFSS are embarking on a major new initiative to launch a £800,000, three-year funding programme to enable those who care for and provide education for looked after children in the UK receive better support and access to funds. Will this new fund divert scare resources from overseas? Not at all. This is additional, and it has come from an unlikely source; “The Trump Bump” which has increased BFSS’s investment-portfolio, so it can now re-invest in a more urgent social portfolio which will produce a dividend of greater equality and change. So should today’s financially well-run grant-making trusts be proactive in developing forums and authentic learning space which allow funded projects to share, learn from and inspire each other? Is the “nothing about us, without us” tide finally making its way ‘upstream’ and if so, is the funded-organisation voice being heard by funders who want to measure their soft and hard outputs and create a full picture of impact? One person who has thought more than most about the strategic role of funders is Ben Cairns, Director and Founder of the Institute of Voluntary Action Research. He terms this as ‘Funding Plus;’ any activity which is additional to a grant and the grant making process.’ Ben Says, “We have found understanding what kind of contribution you can make as a funder to be a critical component of ‘responsible funding’ – funding that takes account of the possible and the appropriate. For some, going beyond the money may be automatic – it is an expression of values and beliefs”. And so back to Lancaster. How would he be responding if he was alive today? Would he be turning in his grave 200 years on at the news that so many children in our world still have no access to quality education? Or would he be smiling from on high at the way pioneers are seeking to bring about effective change by deliberately learning from the little people working on the ground? At the end of the intensive day, those present were asked if they wanted to become members of the society. Not to crowd-fund but to crowd-think and crowd collaborate. Now that’s an interesting theory of change, and if BFSS can turn this into a practice of change and continue to value and amplify the learner’s-voice, there may yet be a far greater crowd-change. 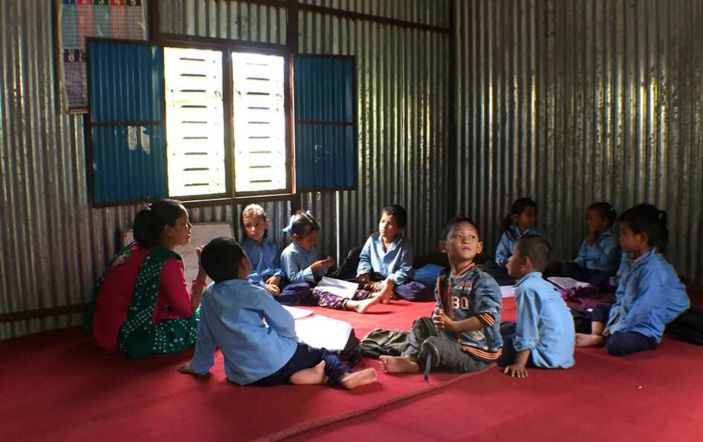 As it has in NE India where the Charity I run works and where schools have been closed.